With a boundless variety of outfits and styles available, there’s no reason why you shouldn’t be taking on the trends you dream of wearing on your child’s big day. These popular styles are guaranteed to make you look and feel gorgeous on your daughter or son’s big day. In the last few years, shoulders have been all over the runway, so it’s no surprise to see off the shoulder MOB and MOG gowns making a waves in the wedding world. Elegant and modest off the shoulder dresses add feminine charm and glamour. We are obsessed with this look from Macbees, Killarney! Mixing the style of the roaring 20’s with Meghan Markle’s trends, this silk shirt and fringe skirt looks sophisticated and effortless. Don’t be afraid to go bold with colour and add accessories like a belt or strappy heel. Churches can get quite cold as we’re coming into the autumn/winter months, so why not add a fashionable coat or shawl to keep your warm. There are so many beautiful MOB/G pieces that have matching accessories and cover ups. The embellished sparkle on the sleeves and dress adds glamour, without you having to buy expensive jewellery or accessories, we love it. Most people think that MOB/G’s should always wear bright and colourful dresses, however that doesn’t have to be the case. Especially coming into the winter months, rich colours such as plum, emerald green, midnight blue and black all look beautiful. 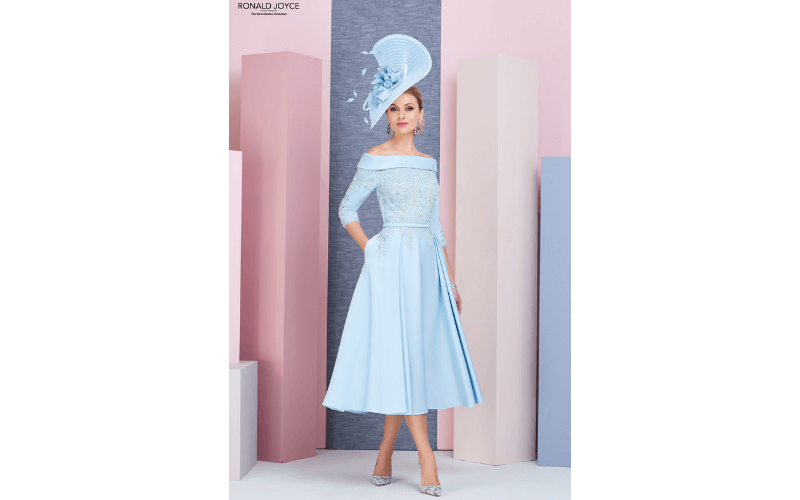 You can add pops of colour, be that in accessories such as hats and handbags, but also in the look, just like this dress with the bell sleeves; it looks feminine and modern. Plus, the darker tones are extra slimming! After the Royal Wedding back in May, all eyes weren’t just on Prince Harry and Meghan Markle, they were also adoring Amal Clooney and her fabulous outfit choice. Her mustard ensemble courtesy of Stella McCartney, was completed with a beautiful bespoke headpiece, oozing style, glamour and feminine charm. 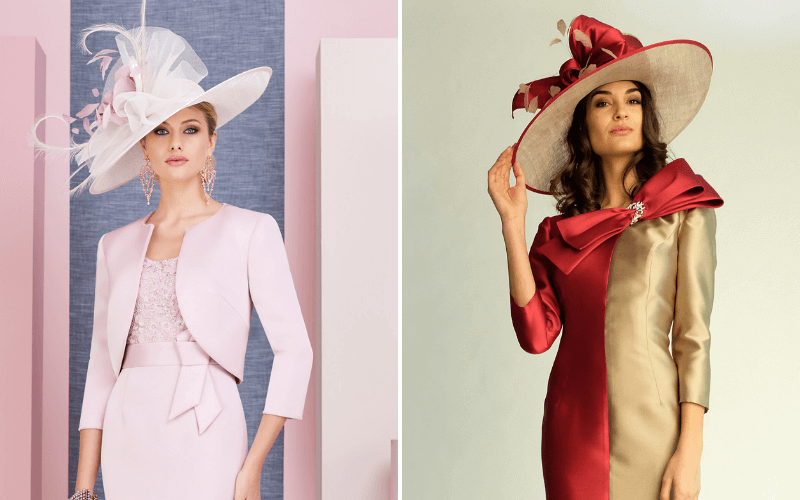 The bigger the brim the better, take a look at these designs from Macbees, Killarney, they have so much detail with netting and veils. Tilting your head-wear to one side, just like Amal, shows confidence; you too can walk down the aisle as though you had George Clooney on your arm.